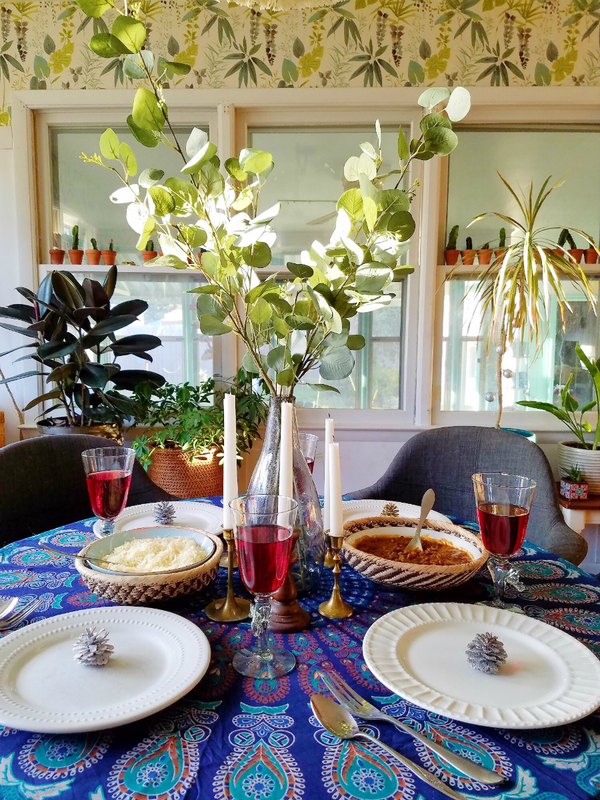 Amidst the chaos that can be the weeks leading up to Christmas, it can be a lot of stress to take on hosting a dinner party of any size. Keeping the details simpler let's everyone focus more on gathering together and enjoying one another's company. Our table is quite small and also serves as a gift wrapping and crafting station pretty much every day this time of year. 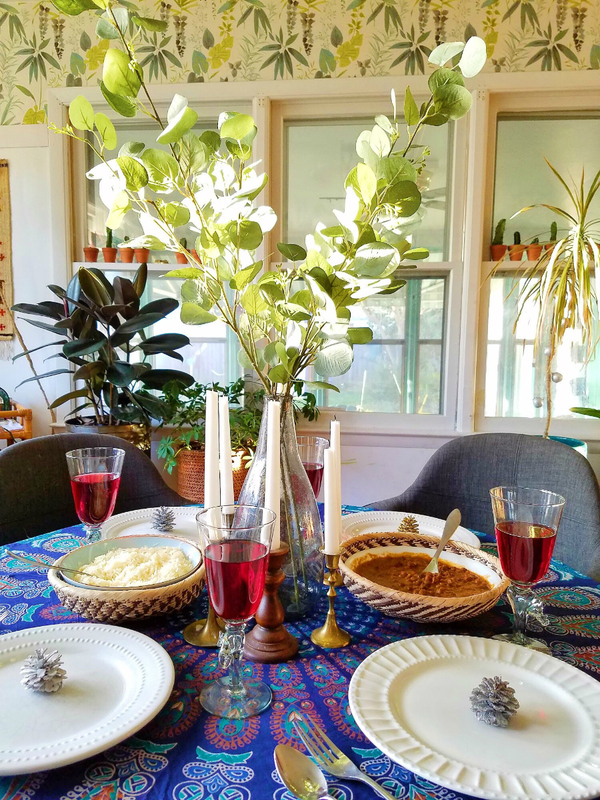 In order to achieve a balance between practicality and something beautiful that feels special, I've designed this simple boho holiday table setting. 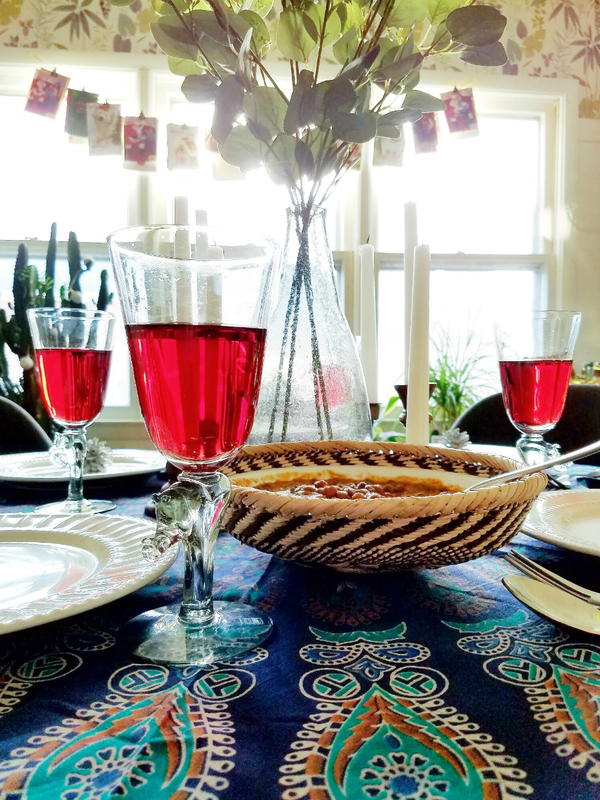 Products were provided by Mbare to create this table setting. Amazon links are affiliate links. 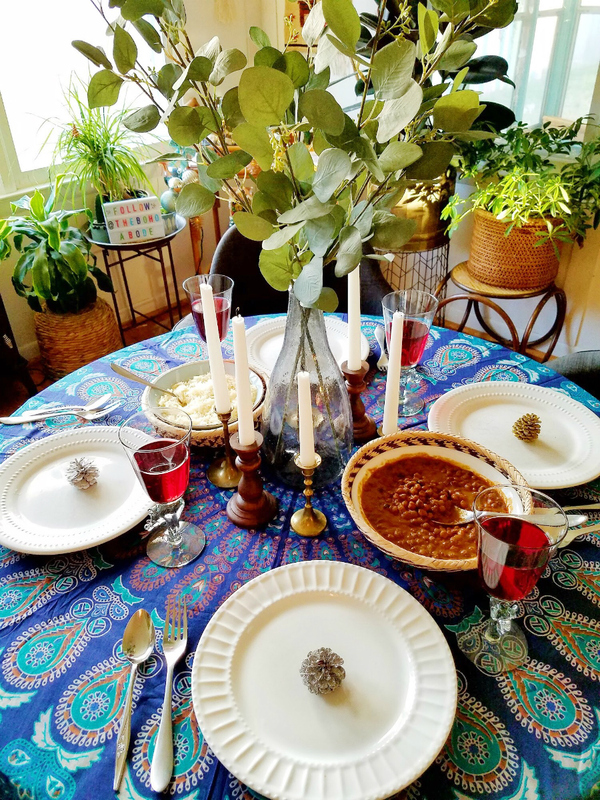 The first layer I like to use for a table setting is a table cloth. 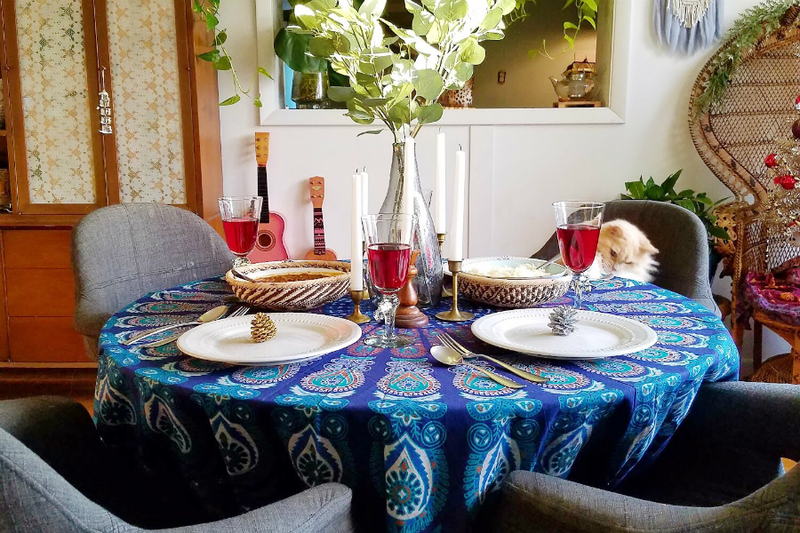 I've used a variety of difference types of fabric to use as a table cloth but I wanted something cooler toned that what I have on hand to nod to the winter season we are falling into here. 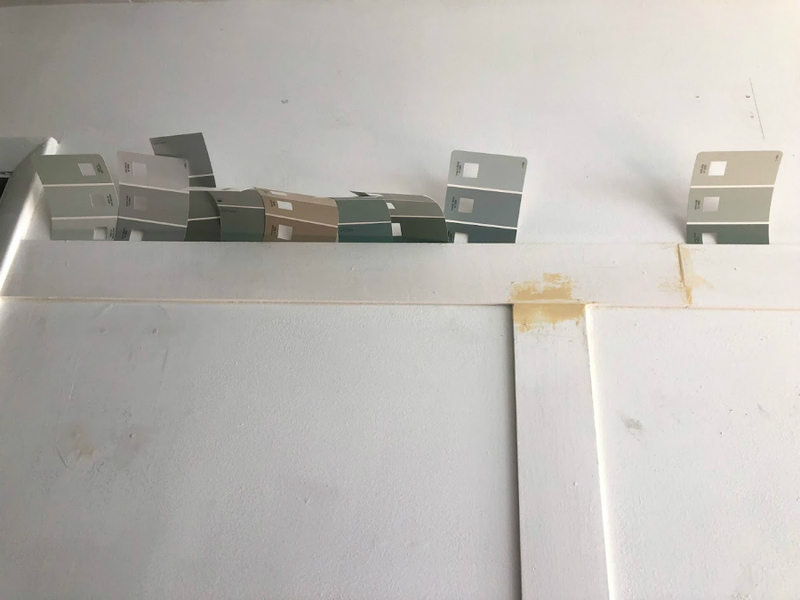 I chose a darker blue with green and warm brown details. 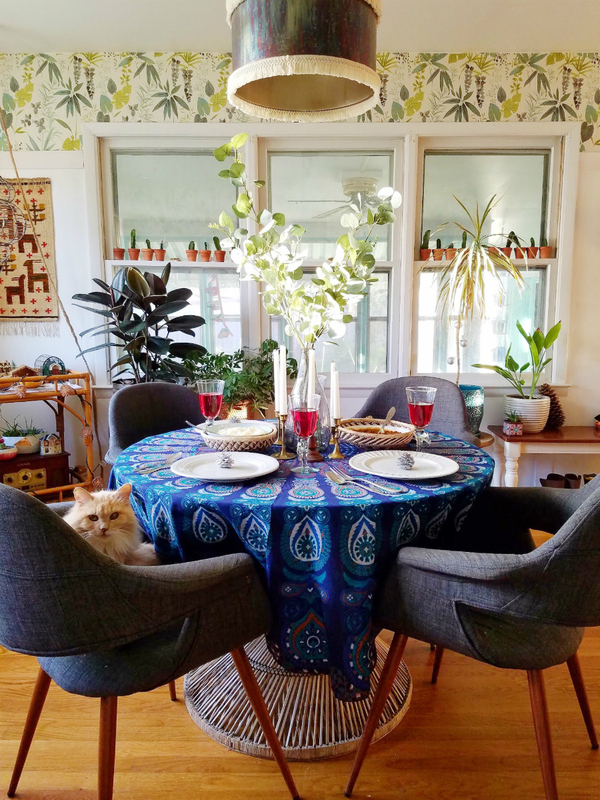 I went with this multipurpose round tapestry to keep it budget friendly. For the centerpiece, I placed faux eucalyptus branches in the Mbare tall teardrop grey recycled glass vase. 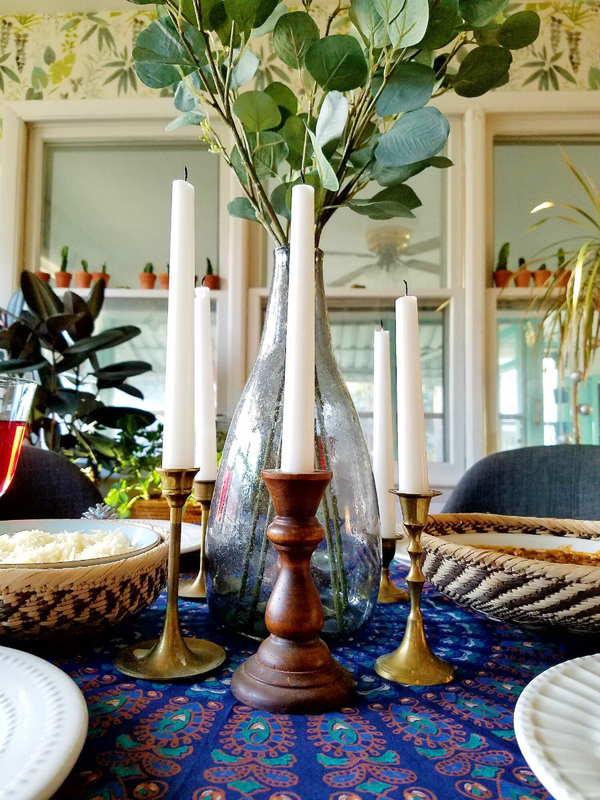 To add more interest and ambiance, I added brass and wood candlestick holders that I've collected from various thrift stores. Simple white tapers brighten things up without distracting from the existing decor. The table is small but I still like to walk the line between simple and maximal with it. On their own, the items making up the centerpiece aren't that impactful. But they balance the loud pattern of the tablecloth. For serving the food, I've placed bowls inside of Mbare Small Tonga Baskets. The baskets camouflage basic boring bowls and give them a more interesting look. The texture of the weave also adds another layer to the design and feel of the table. They beautiful baskets and will look beautiful on the wall when they aren't jazzing up dishes on the table. The food doesn't need to be extravagant. And it also doesn't need to be kept right at the table. Planning out where food and drink stations will be ahead of time is a great idea to make the meal flow easier the day of. The meal I've prepared today is bengal lentils and basmati rice. And each part of the dish occupies the two bowls on the table so that people can help themselves to as much of each as they like. For a larger spread, you could keep dinner rolls and a main dish at the table in the two smaller bowls with the rest of the food on a kitchen counter, bar cart, or buffet table. To set the table, I've put out my Mbare recycled wine glasses with animal stems for a touch of whimsy. The animals are rhinos, hippos, warthogs and elephants so each person gets their own different animal spirit of the evening. You can mix and match or buy all of the same animal as the glasses are sold individually. The plates are generic dollar store plates that come out throughout the whole year. We don't need anything extravagant for a simple meal like this. There's just no table space to be moving different dishes about so keeping it down to the essentials saves space. Mbare is a company that focuses on bringing handmade, sustainably made goods from artisans throughout Africa to us. 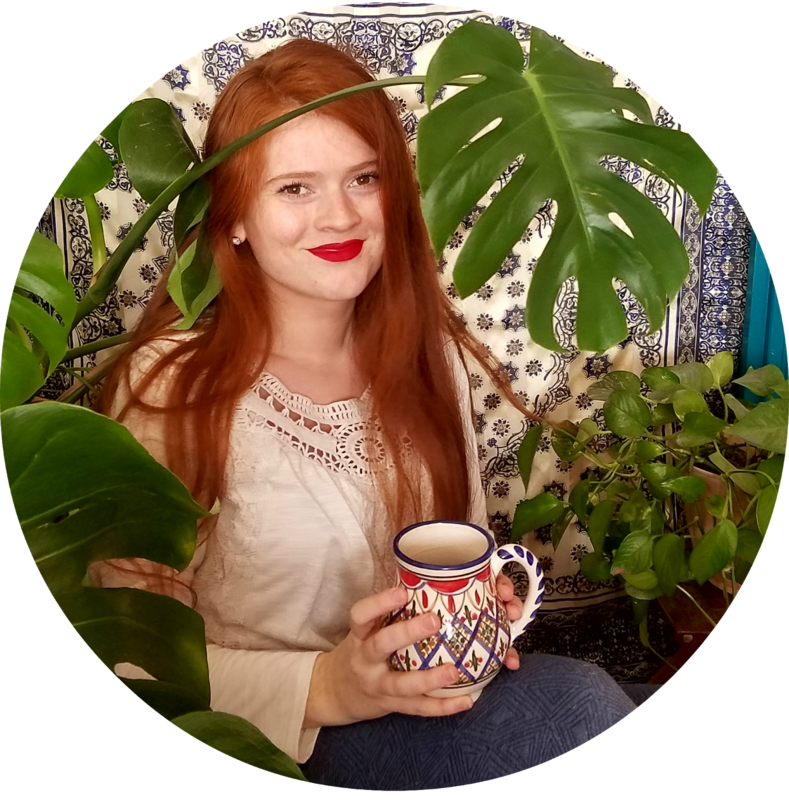 The company follows fair trade practices and has a dedicated "Artisans" page on their site where you can view pictures and read about the people behind the items for sale on the website. 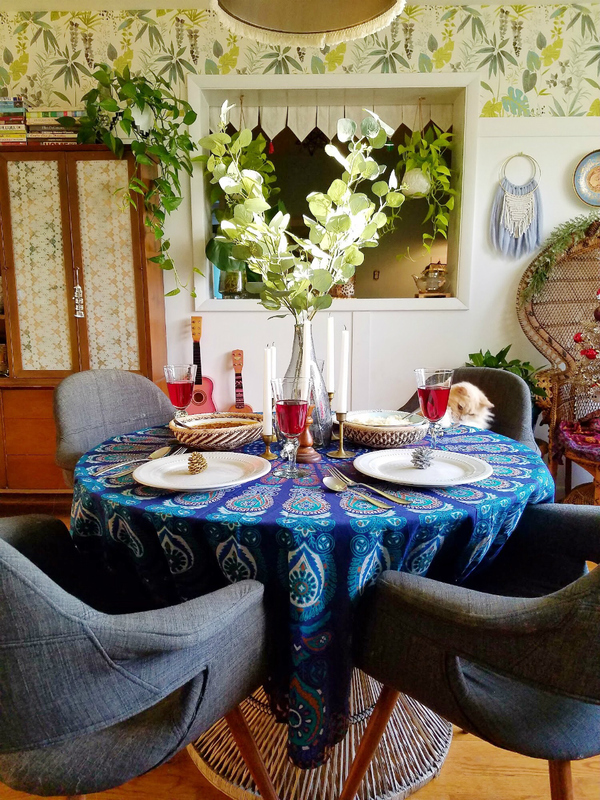 Their goods make beautiful additions to a special occasion table setting but they also have home goods for every room of the home and gifts for everyone. 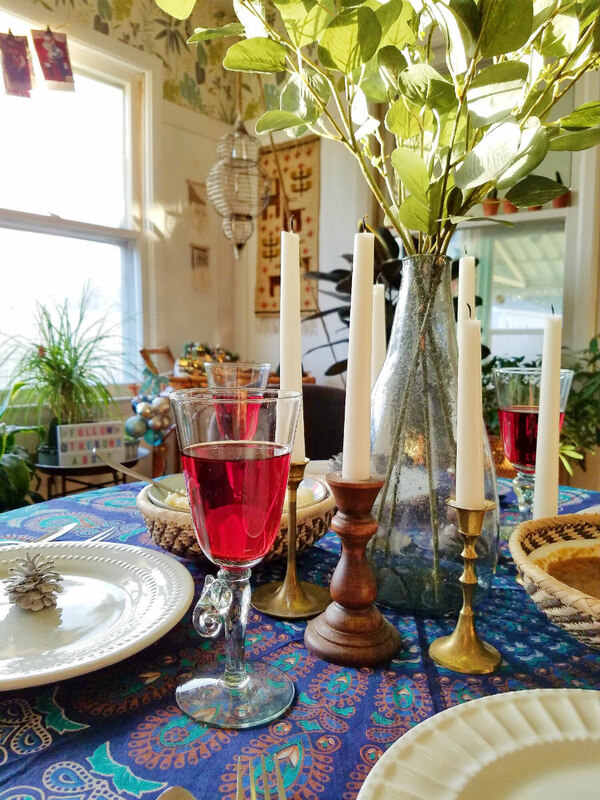 You can add global style to your holiday table setting by shopping goods from Mbare. 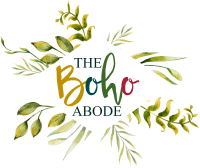 Use the discount code BOHO15 for 15% off your purchase. You'll be able to use these pieces throughout the whole year so I think they'll be valuable additions to your collection. Don't forget to follow their Instagram (@mbare_homeandgift) to keep up with future sales and new items, too! I'm really excited to slow down, take it easy, keep it simple and appreciate the time I get to spend with the people that are important to me. One of these years I'd like to have a larger table and maybe even try my hand at hosting a gathering. 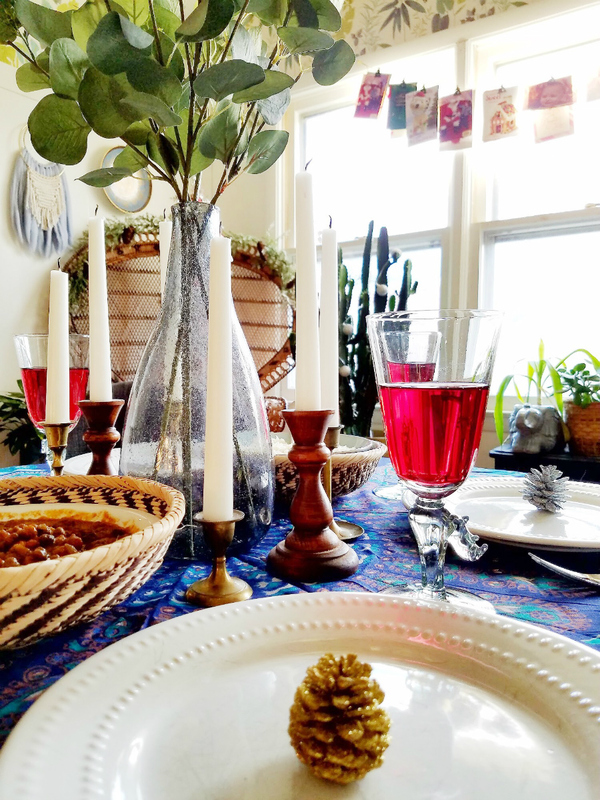 But for now, this small boho holiday table setting is perfect for the phase of life I am in right now. 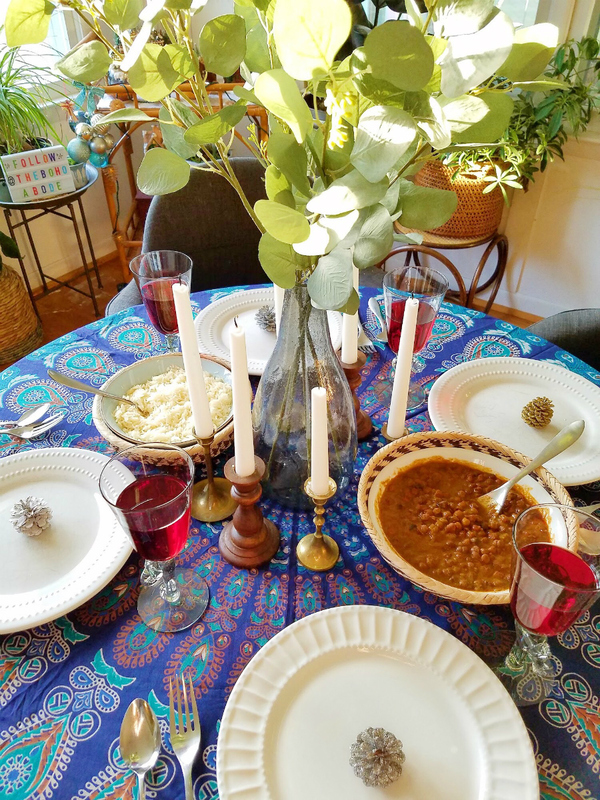 I hope you've found some ideas to try out with your holiday table setting.